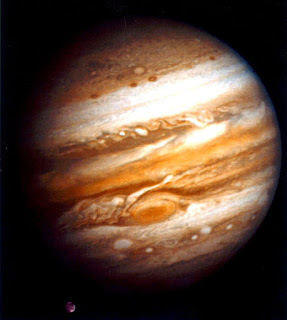 Below is the horoscope of the New Moon @26Can54 on July 19, 2012 at 12:24:02 am edt Capitol Building Washington DC. 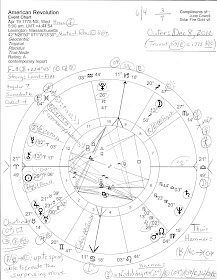 It's a Saturn Hour with a couple of Cardinal T-Square patterns formed between a conflict-ridden Mars-Uranus opposition and powerful manipulator Pluto 7Cap46 Rx in 9th house (when the chart is set for DC), and Saturn/ASC pointing toward the Sun and Moon in 4th H of Home, Homeland, and Real Estate. 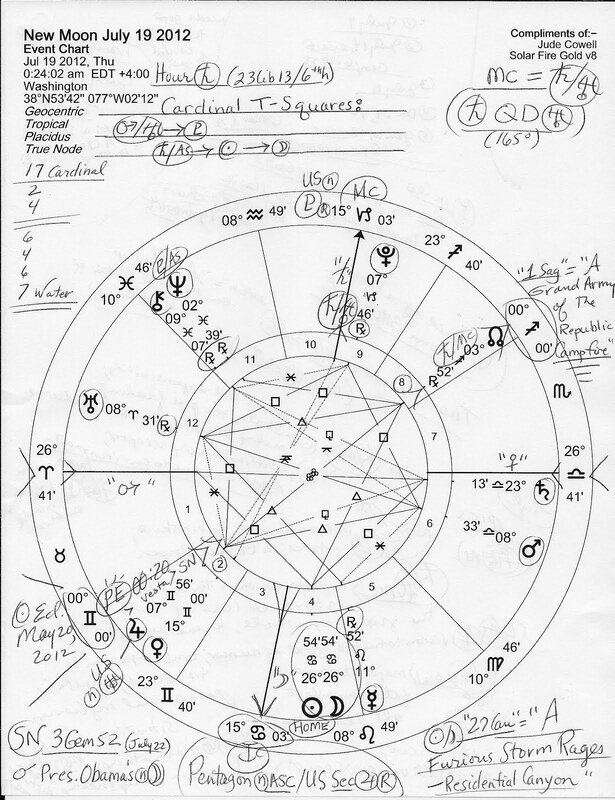 Perhaps the potential manifestations contained within the chart's midpoint pictures (from the T-Squares and other midpoints) will yield information about the new cycle of activity timed by this New Moon in Cancer, sign of home, nurturing, security, and business matters. The pictures are listed below the horoscope image (with interpretations by Noel Tyl); any, all, or none may apply. Click the chart to enlarge for some basic information and for a notation that the transiting South Node of the Moon (3Gem52 in 2nd H) is now lining up with President Obama's natal Moon, an indicator of separation (from public approval? in the home? more threats to Mrs. Obama? hopefully not), bad timing issues and scheduling conflicts, and a lack of cooperation from others. Any misuse of position, power, wealth, or popularity may turn up on the president's menu over the next few weeks and will be hard to deal with until this difficult karmic influence has passed. Mars-Uranus = Pluto: intervention of the big shock; force; a Higher Power. Pluto in 9th H may indicate troubles abroad with wars and occupations or with US foreign policy; terrorist attacks cannot be ruled out, plus, GOP opposition to Obamacare (6/12 axis) is obviously on the agenda of certain political factions with 'factions' ruled by Pluto in Mundane Astrology. Saturn-ASC = Sun: taking full responsibility; strategizing for personal freedom; making things happen through hard work. Saturn-ASC = Moon: difficulty being accepted; depression due to environment. Pluto-ASC = Neptune: vision to fulfill; embarrassment to transcend; fight against rumor; something paranormal influences situations. Saturn-Uranus = MC: recognition of one's thrust for individuality or loss of self to the grip of controls; break away from the old. 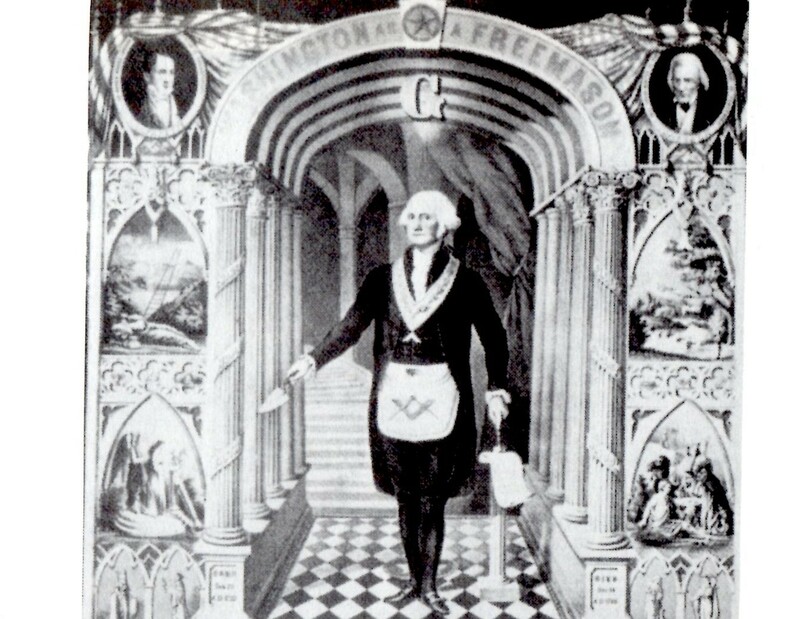 (Saturn QD Uranus = interruption of governing systems; defiance of law and order--The Quindecile--Ricki Reeves); this picture is prominent for its angularity at MC and its connections to government, old v new, and the Middle East. Saturn-MC = NN: major stroke of fate may affect all development. Saturn-MC = President Obama's natal Moon: renunciation; an attack on private emotions. Sun-Moon = US natal Pluto: a critical time of development; separation in order to start anew (New Moon); potential new perspectives in relationships. "A Furious Storm Rages Through a Residential Canyon" which highlights storms and water damage from weather conditions, possible turbulence at the White House, and/or a potential for more real estate or mortgage difficulties in the US. Yet perhaps the 'new cycle of activity' indicated by the July 19 New Moon will work on beneficial levels as well. 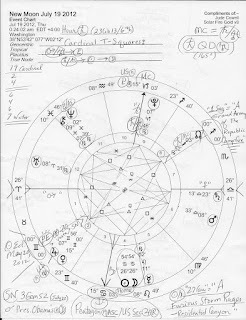 Addionally, transit Jupiter in Gemini is within orb of squaring President Obama's natal Pluto in Virgo, a period which began on July 9, 2012 and occurred July 14 (exact), on July 19 (this New Moon! ), December 29, 2012, January 10, 2013 (exact), February 18, 2013 (exact), and March 3, 2013, a period when covering too wide a base is problematic and sights must be shortened in order to make progress--one step at a time.